he brilliance of its cut and the characteristics of its shape. This ring has tapered baguette diamonds set on the shank to either side of an emerald-cut diamond. The base metal is hidden when viewed from above, and the transparency and crisp brilliance of the main stone give the ring a very sleek appearance. It would be a poor choice to use brilliant-cut marquise or pear shapes on either side of an emerald-cut center stone, since such brilliant cuts tend to overpower the clear transparency of an emerald cut. On the other hand, if the center stone is a pear shape or a marquise, tapered baguettes on either side will enhance its appearance. In this way, the various shapes have their own generally accepted uses in gemstone-oriented jewelry, according to the characteristic brilliance of each cutting style. Fancy shapes combine the elegance of diamonds with a playful character, and it is this free-spirited nature that makes them attractive. Marquises have a sharp and refreshing shape. They look especially large for their size, and have a classic appearance. 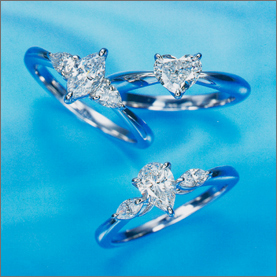 Heart shapes are set in rings as solitaires. They are quite wide, and because their distinctive shape is more apparent when they are set by themselves, it is generally accepted that they are most beautiful when standing alone. Some people are passionate fans of the heart shape.